Former British ambassador to Syria, Peter Ford. An expert assessment of the origins of the Syrian civil war, the role of foreign interests in prolonging the conflict, and why it is vital that sanctions against Syria be lifted, will be given in Galway next week. 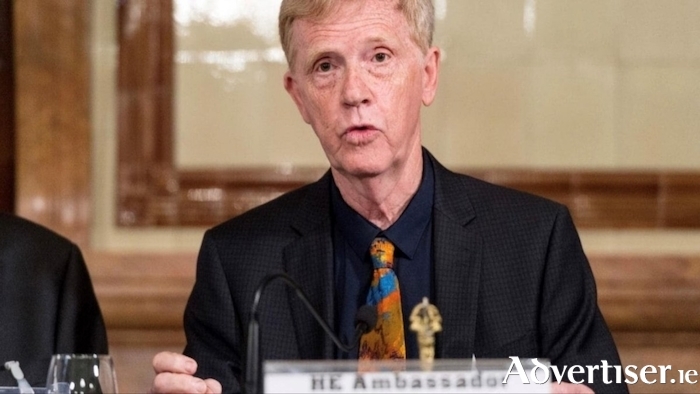 The former British ambassador to Syria, Peter Ford, will speak at a public meeting, entitled Lift Sanctions off Syria, which takes place on Tuesday November 20 at 8pm in Richardson’s, Eyre Square. Mr Ford has huge experience working first as a diplomat in the Middle East and then, from 2006-15, as the representative of the Commissioner General of the United Nations Relief and Works Agency for Palestine Refugees, based in Jordan. He is also the co-chair of the British Syrian Society and founder member of the Global Network for Syria, a group of eminent experts, mostly members of the House of Lords. During his three day visit to Ireland, Mr Ford will hold an information meeting with members of the Oireachtas in Leinster House, which has been organised by Independents for Change. Next Monday, November 19 at 8pm, he will have a “Conversation with Vincent Browne” in the UNITE hall in Middle Abbey Street Dublin. Page generated in 0.2187 seconds.